کریمی, مرضیه, فیروزان, توحید. (1394). بررسی میزان اثرپذیری عملکرد بانک‌ها از نرخ سود عقود مبادله‌ای. فصل‌نامه مطالعات مالی و بانکداری اسلامی, 1(پاییز و زمستان), 115-139. مرضیه کریمی; توحید فیروزان. "بررسی میزان اثرپذیری عملکرد بانک‌ها از نرخ سود عقود مبادله‌ای". فصل‌نامه مطالعات مالی و بانکداری اسلامی, 1, پاییز و زمستان, 1394, 115-139. کریمی, مرضیه, فیروزان, توحید. (1394). 'بررسی میزان اثرپذیری عملکرد بانک‌ها از نرخ سود عقود مبادله‌ای', فصل‌نامه مطالعات مالی و بانکداری اسلامی, 1(پاییز و زمستان), pp. 115-139. کریمی, مرضیه, فیروزان, توحید. بررسی میزان اثرپذیری عملکرد بانک‌ها از نرخ سود عقود مبادله‌ای. فصل‌نامه مطالعات مالی و بانکداری اسلامی, 1394; 1(پاییز و زمستان): 115-139. نظر به اهمیت بانک­‌ها در اقتصاد کشور، لازم است که عوامل داخلی و خارجی تاثیرگذار بر عملکرد بانک‌ها مورد بررسی قرار گیرد. در این راستا، این مقاله به بررسی تاثیر نرخ سود عقود مبادله‌­ای بانکی، بر عملکرد بانک‌ها در طول سال­های 87-92 می‌پردازد. برای این منظور، از تحلیل‌های اقتصادسنجی و برآوردهای پانل دیتا استفاده شده است. نتایج نشان می­‌دهد که بین نرخ سود و سایر متغیرهای انتخابی با سودآوری بانک رابطه معناداری وجود دارد. این مطالعه نشان داد که نرخ سود تسهیلات عقود مبادله‌‌ای، رابطه مثبتی با معیار نسبت بازده دارایی بانک­ها دارد. از این­رو، برخی از بانک‌های منتخب و مورد بحث در این مطالعه که به دلیل شرایط تورمی، در افزایش دارایی‌ها سرمایه‌گذاری کرده و دارایی‌های خود را به روش­های مختلف افزایش داده‌اند، از کاهش نرخ سود عقود مبادله‌ای استقبال نمی‌کنند. این بحث، به ویژه با توجه به بنگاه‌داری بانک‌ها، در مورد عموم بانک‌های کشور قابل طرح است. بر این اساس، عدم چاره­جویی برای بنگاه‌داری بانک‌ها، شرایط را برای نرخ‌های بالای تسهیلات در کشور هموار کرده است. همچنین، نتایج نشان می‌دهد که متغیرهای بانکی دیگر، از جمله نسبت درآمد بدون بهره به دارایی و نسبت وام به دارایی، با سودآوری بانک‌ها رابطه مثبت و معنی­‌داری دارند. Considering the important role of banks in the economy, it is necessary to study the effect of internal and external factors on the performance of banks. In this regard, this paper examines the impact of bank profit rates of the exchange contracts on the performance of banks during the time period of 2008-2013. For this purpose, econometrics analysis and estimation of panel data is used. The results show that there is a significant relationship between profit rate and other selected variables with the bank’s profitability. This study showed that the profit rate of the exchange contracts has a positive relationship with the return on assets ratio of banks. Hence, while selected banks considered in this study have increased their assets using different methods due to the inflationary conditions, they do not welcome the reduction in profit rates of the exchange contracts. This issue may be true in all other banks due to their role in corporates ownership. Accordingly, finding no solution to leave corporate ownership by the banks, the conditions for high rates of loans in the country is paved. Also, the results show that the other banking variables such as, interest-free income to assets ratio and loan to asset ratio, has a significant and positive correlation with the profitability of banks. اسلامی، حبیب ا... و علی بهمنی، اثر تعیین نرخ سود تسهیلات بر کارایی بانکداری اسلامی،www.sid.ir. اسلامی، زهرا.1390: ضرورت تدوین الگوی رتبه‌­بندی بانک‌­­ها و ارایه مدل پیشنهادی. اداره تحقیقات و کنترل ریسک بانک سپه. ایران­زاده، سلیمان.1387: رتبه‌­بندی و ارزیابی عملکرد بانک با استفاده از تکنیک تجزیه و تحلیل مولفه‌­های اصلی، فصلنامه مدیریت، سال ششم، شماره 14. 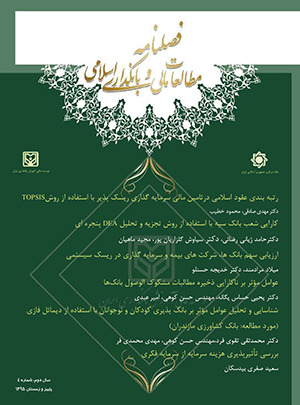 تفضلی، فریدون.1379: اقتصاد کلان، نظریه‌­ها و سیاست­‌های اقتصادی، نشر نی. توتونجیان، ایرج.1379: پول و بانکداری اسلامی و مقایسه آن با سیستم سرمایه­‌داری، نشر توانگران. تهران. تجلی، آیت­اله.1389: آثار کاهش نرخ سود بانکی بر تورم، اشتغال و سرمایه‌­گذاری، دفتر مطالعات اقتصادی، مرکز پژوهش­‌های مجلس. دادگر، یداله و توحید فیروزان سرنقی.1391: ارایه چارچوبی برای تعیین نرخ سود در عقود مبادله‌ای، فصلنامه پژوهش‌های اقتصادی (رشد و توسعه پایدار)، سال دوازدهم، شماره چهارم، زمستان، صص 102-79. دیواندری، علی و همکاران.1387: بررسی رابطه بین بازارگرایی و عملکرد بانک­های تجاری ایران، اقتصاد، تحقیقات اقتصادی، شماره 83. رضانژاد، اکبر.1389: نسبت‌­های مالی در عملکرد بانک، مجله بانک و اقتصاد، شماره 110. سوری، علی. اقتصاد سنجی، ویرایش چهارم، چاپ پنجم، انتشارات فرهنگ شناسی. شاخص‌­هایی برای ارزیابی عملکرد بانک‌­ها،1381، دفتر مطالعات برنامه و بودجه، مرکز پژوهش‌­های مجلس. عباس‌قلی­پور، محسن.1389: عوامل موثر بر بهبود عملکرد بانک. مجله بانک و اقتصاد. کریمخانی، عباس و مهتاب فراتی.1391: بررسی اثر متغیرهای کلان اقتصادی بر منابع و مصارف بانک، اداره تحقیقات و کنترل ریسک بانک سپه. گجراتی، دامودار. مبانی اقتصادسنجی، جلد دوم، چاپ هشتم، انتشارات دانشگاه تهران. Abbasoglu, O.E, A.F. Aysan, and A. Gunes.2007. Concentration, Competition, Efficiency and Profitability of the Turkish Banking Sector in the Post-Crisis Period.Banks and Bank Systems 2, no. 3, 106-15. Abayomi, T. O. and Adebayo, M. S.2010.Determinants of Interest Rates in Nigerian.Journal of Economics and International Finance, 2(12): 271-261. Adofu, M. I. and Audu, S. I. 2010. An Assessment of the Effect of Interest Rate Deregulation inenhancing Agricultural production in Nigeria, Current Research Journal of Economic Theory,2(2), 86-82. Aharony, J., A. Saunders, and I. Swary.1986. The Effects of a Shift in Monetary Policy, Regime on the Profitability and Risk of Commercial Banks, Journal of Monetary Economics, 17, 363–373. Adofu, M. I. and Audu, S. I. 2010. An Assessment of the Effect of Interest Rate Deregulation inenhancing Agricultural production in Nigeria, Current Research Journal of Economic Theory,2(2), 82-86. Akella, S. R. and S. I. Greenbaum.1992. Innovations in Interest Rates, Duration, Transformation, and Bank Stock Returns,Journal of Money, Credit, and Banking, 1, 27–42. Akhavein, J., A.N. Berger, and D.B. Humphrey.1997.The Effects of Megamergers on Efficiency and Prices: Evidence from a Bank Profit Function, Review of Industrial Organization 12, no. 1,95-139. Alexandru,Caruntu and Laurentiu, Romanes.2008. The Assessment of Banking Performances- Indicators of Performance in Bank Area.Munich Personal RePEc Archive. http://mpra.ub.uni-muenchen.de/11600/. Bae, S. C. 1990.Interest Rate Changes and Common Stock Returns of Financial Institutions, Revisited, Journal of Financial Research, 1, 71–79. Ben Naceur, S. 2003.The determinants of the Tunisian banking industry profitability: panel evidence.Paper presented at the Economic Research Forum (ERF), 10th Annual Conference, Marrakesh-Morocco, December, 16-18. Berger, A., Hanweck, G. and Humphrey, D. 1987.Competitive viability in banking: Scale, scope and product mix economies. Journal of Monetary Economics 20, 501- 520. Berger, A.N. and Humphrey, D.B. 1997. Efficiency of financial institutions:international survey and directions for future research, European Journal of Operational Research, Vol 98, pp.175-212. Bikker, J. and H. Hu.2002.Cyclical Patterns in Profits, Provisioning and Lending of Banks and Procyclicality of the New Basel Capital Requirements, BNL Quarterly Review, 221,143-75. BIS .2002. Interest rate risk and bank net interest margins, BIS Quarterly Review, December, Bank for International Settlements. Bourke, P.,1989. Concentration and Other Determinants of Bank Profitability in Europe,North America and Australia.Journal of Banking and Finance 13, no. 1: 65-79. Boyd, J. and D. Runkle.1993. Size and Performance of Banking Firms: Testing the Predictions Theory.Journal of Monetary Economics 31, no.47-67. Bubekri,cosset and fischer, guedhami.2005.Privatization and bank performancein developing countries.Journal of Banking & Finance. 2015–2041. www.elsevier.com/locate/jbf. Choi, J. J. and E. Elyasiani .1997. Derivative Exposure and the Interest Rate and Exchange Rate Risks of U.S. Banks, Journal of Financial Services Research, 12, 267–286. Donald R. Fraser, Wallace Phillips, Jr. and Peter S. Rose.1974. A Canonical Analysis Of Bank Performance.The Journal of Financial and Quantitative Analysis, Vol. 9, No. 2,pp. 287-295. Ewert, R., Szczesmy, A. and Schenk, G.2000. Determinants of Bank Lending Performance in Germany,Schmalenbach Business Review (SBR), 52, 344 – 362. FarukAysan, S. and anli Pinar Ceyhan.2008. What determines the banking sector performance in globalized financial markets? The case of Turkey, Physica A 387 ,1593–1602. Goddard, J., P. Molyneux and J. Wilson.2004.Dynamic of Growth and Profitability in Banking. Journal of Money, Credit and Banking 36, no.1069-90. Hanweck, G. A. and L. H. Ryu .2005.The Sensitivity of Bank Net Interest Margins andProfitability to Credit, Interest Rate, and Term-Structure Shocks Across Bank Product Specialization,Working Paper No. 03-05, Federal Deposit Insurance Corporation. Hassan, M.K. and A.H.M. Bashir.2003.Determinants of Islamic Banking Profitability.Paper presented at Tenth ERF Annual Conference, 16-18 December, Morocco, 2003. James,Mark, flannery.1980.market interest rate and commercial bank profitability.An empirical investigation, Research paper No.53 federal reserve bank of Philadelphia. Kosmidou, K. 2008.The determinants of banks’ profits in Greece during the period of EU financial integration, Managerial Finance ,Vol. 34, No. 3,pp. 146-159. Kosmidou,K.,Pasiouras,F.andTsaklanganos,A. 2006. Domestic and multinational determinants of foreign bank profits: The case of Greek banks operating abroad, Journal of Multinational Financial Management 17, 1-15. Koutsoyiannis, A. 2003. Theory of Econometrics (Second Edition). New York: Palgrave.Manove, M., Padilla, A. J. and Pagano, M. (2000), Collateral vs. Project Screening: A Model of Lazy Banks, Paper Presented at the Seminar Competition among Banks: Good or Bad? Kumbirai, Webb.2010. A financial Ratio Analysis of Commercial Bank, Performance in South Africa". African Review of Economics and Finance, Vol. 2, No. 1, Dec 2010. Kumiko, O. 2007. Banking System Reform in China: The Challenges of Moving Toward a Market-Oriented Economy. Kwan, S. H. 1991.Re-examination of Interest Rate Sensitivity of Commercial Bank Stock, Returns Using a Random Coefficient Model, Journal of Financial Services Research,5,61-76. Lumpkin, S. A. and J. M. O’Brien 1997.Thrift Stock Returns and Portfolio Interest Rate, Sensitivity, Journal of Monetary Economics, 39, 341–357. Miller, S.M. and A. Noulas.1997. Portfolio Mix and Large Bank Profitability in the USA, Applied Economics 29, no. 4, 505-12. MohdSaid.MohdHanafi .2010. Performance and Financial Ratios of Commercial Banks in Malaysia and china. www.ssrn.com. Molyneux, P. and J. Thornton.1992. Determinants of European Bank Profitability: A Note. Journal of Banking and Finance 16, No. 6: 1173-1178. Abbasoglu, O.F. A.F. Aysan and A. Gunes, Concentration,2007. competition, efficiency and profitability of the turkish banking sector in the post-crises period, The Banks and Bank Systems 2 (3) (in press). Okoye,Richard.2013. Effect Of Bank Lending Rate On The Performance Of Nigerian Deposit Money Banks. International Journal of Business and Management Review. Vol. 1, No. 1, March 2013, pp.34-43. Okoyev.Onyekachi.2013. Effect Of Banklending Rate On The Performance Of Nigerian Deposit Money Banks, International Journal of Business and Management Review, Vol. 1, No. 1, pp. 43-34. Patnaik I. and Vasudevan, D. 1998.Interest Rate Determination: An Error Correction Model,National Council Appl. Econ. Res. New Delhi. 110002. Paul.Samuelson.1945. the effect of interest rate increase on the banking system,the American economic review,Vol35.No.1. Mars27-,16. Randhawa, D.S. and G.H. Lim.2005.Competition, Liberalization and Efficiency: Evidence from a Two Stage Banking Models on Banks in Hong Kong and Singapore. Managerial Finance 31, No. 52-77. Rasheed, O. A. 2010. Mergers and Acquisitions (M&As) in the Nigerian Banking Industry: An Advocate of three Mega Banks, European Journal of Social Sciences, 18(4), 561-556. Rivard, R.J. and C.R. Thomas.1997. The Effect of Interstate Banking on Large Bank Holding Company Profitability and Risk, Journal of Economics and Business 49, No. 1, 61-76. Robert,Ataggart and Geoffrey Volgom . 1978 . saving bank reactions to ceilings and rising market rate, new England Economic Review, Federal Reserve Bank of Boston,pp. 31-17. Saunders, A. and P, Yourougou .1990. Are Banks Special? The Separation of Banking, from Commerce and Interest Rate Risk, Journal of Economics and Business,42, 171–182. Stiroh, K. J. 2004.Diversification in Banking: Is Noninterest Income the Answer?,Journal,of Money, Credit and Banking, 36, 853–882. Stiroh, K. J. 2006.A Portfolio View of Banking with Interest and Noninterest Activities, Journal of Money, Credit and Banking, 38, 1351–1361. Thakor, A.1987. Discussion. Journal of Finance 42 . 661-63. Wensheng, Peng, Kitty, Lai, Frank Leung and Chang Shu of the Research Department.2003. The Impact of Interest Rate Shockson the Performance of the Banking Sector, Hong Kong Monetary Authority Quarterl Bulletin. William B., English, Skander J. Van Den Heuvel and Egon Zakrajsek .2012. Interest rate risk and bank equity valuation, may.